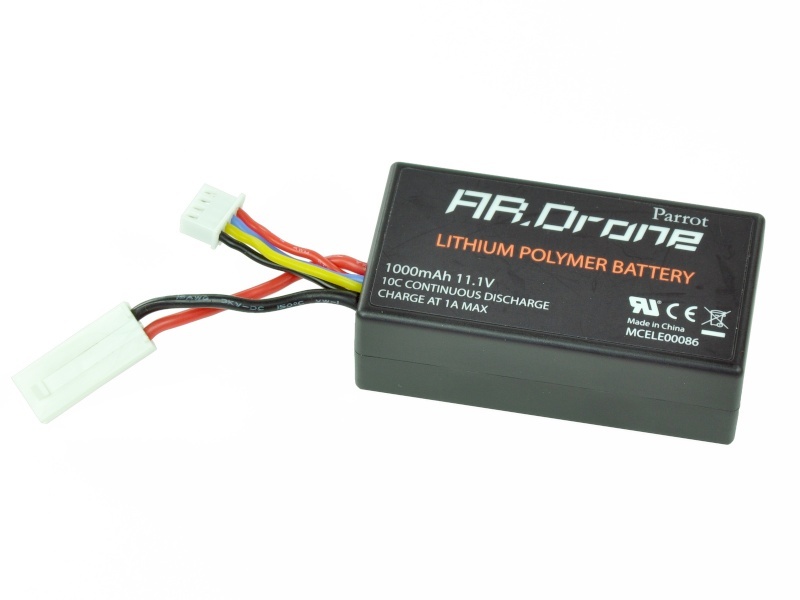 The Parrot AR.Drone helicopter battery is a 3 cells high grade Lithium-Polymer battery, with a capacity of 1,000 mAh at 11.1 volts and a discharge capacity of 10C. It includes a PCM (Protection Circuit Module) which protects the battery against over charge, over discharge and short circuits. The battery is protected by a rigid casing, and complies with UL2054 safety standards. The 1000mAh 11.1V lithium polymer battery is attached via a connector, making it delightfully easy to remove. The second connector is a balance charge connector, which ensures that each of the three battery cells is charging equally, thus optimizing capacity and prolonging battery life. Parrot claims the battery will only last about 12 minutes after a full charge, which takes around 90 minutes. Taking your AR.Drone out to the park with only one battery won't get you much play time, unfortunately.